From 9 am to 12 midnight. 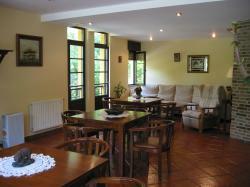 Hotel Benzúa is in Llanes and is located in Valle de Ardisana, a perfect place to be in touch with nature. Hotel Benzúa has been recently renewed and built with traditional materials like stone and wood. The property comprises 2 double rooms and 8 double rooms all of which are equipped with central heating, television and a full bathroom. Clients can book activities such as hiking, bungee jumping, canoe, bike or horseback riding at our hotel. A few meters away from the hotel there are prestigious restaurants like Casa Xisco where guests can savor the best corn tortillas with homemade chorizo and eggs. �Contamos Contigo� is another typical restaurant where exquisite lamb dishes are served and another great restaurant in the vicinity is �Las Cuevas�. The beach is just 10 km away from our hotel and other interesting places to visit are Los Picos de Europa, Covadonga, Cangas de Onís and Llanes. Built in 1996, renovated in 2006. 20 beds, 10 rooms, 2 floors.